ich möchte das LM 105. Bieten Sie dafür Ladedaten? Kann man das LM 105 auch aus einem gewöhnlichen Lauf einer Blaser R8 verschießen und gute Ergebnisse erzielen. LM: Nein. Das Geschoß biete ich nicht an. Man bräuchte Sonderläufe. Long Ranges indispensably need long and slender Bullets. On long Ranges wind slipping Bullets buck the unknown Wind to increase Lethality by a wide Margin (LM-105 over .338" Lock Base almost doubles Lethality from the same Cartridge). Long slender Bullets must not be big Caliber or or heavy Mass. Compare a conventional .50" BMG Ball round a .338 Lapua Magnum with LM-105 and find 19,4 g Mass outshot 48,6g or the 2½ fold! Lightweight long slender Bullest, reduce Rifle and Ammunition Weigth and Recoil. That correspondingly drops 2½ fold. 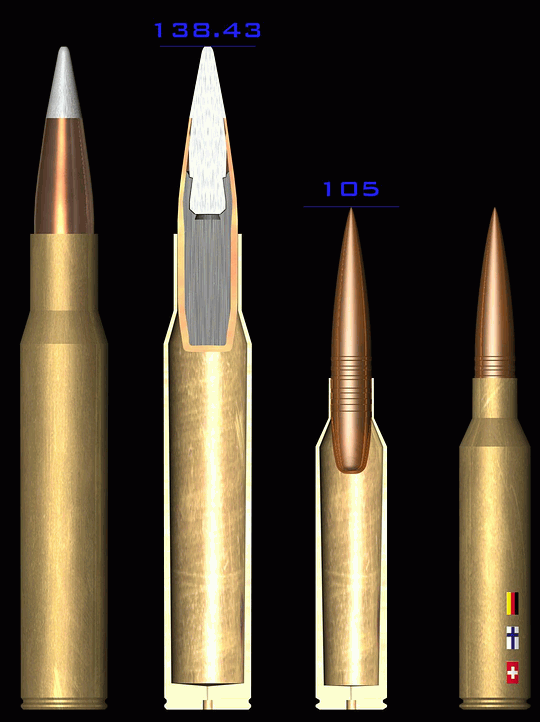 Such smaller Cartridges, like the .338" LM may be easily moderated, to take Flash, Recoil, Dust and some Sound, to greatly reduce Signature, hence reduce the Shooters Visibility on his Mission. Before his Mission allow him to train with less Pain, hence speed Training an increase Confidence and hence Performance. Time has come to kick out heavy old big blunt Projectiles and move forward to new small light long slender Projectiles to perform further with Ease! I stay put to demonstrate! LM 105 won the Lapua Sniper Competion 2005. The Task to precisely hit the Enemy sometimes requires, especially in mountainous Regions, long Shots. In the Korean War over a half Century ago the North Koreans resorted to Russian Surplus 14,5 x 114 Degtjarev Anti tank rifles as a means to shoot further down the Road. The .50"BMG Cartridge is a close Copy of the German 13 mm Mauser Anti tank rifle from WW1, now 98 Year ago. In Vietnam the average G. I. already used today's small 5,6x43 NATO Cartridge for close Encounters and rapid fire in a spray-and-pray Manner, taking about 55.000 Rounds for one Enemy Casualty. Snipers there used .30-06 Springfield Rifles or misused said M2 Machine gun with the .50"BMG with about 1,5 Cartridges per Hit rather efficiently. Since then conventional Wisdom proposed big Cartridges for precise long range Work. Must that be so? No! A smarter Approach will equip the demanding Sniper with a potent Weapon that drains not so much from his Transport capabilities and disturbs him not so much with Recoil up to Flinching when shooting and leaves him with less Signature (Fire, Sound, Dust, Leave Movement, without any Compromise in Range or Precision or Performance. The latter actually will increase. See the Solution. 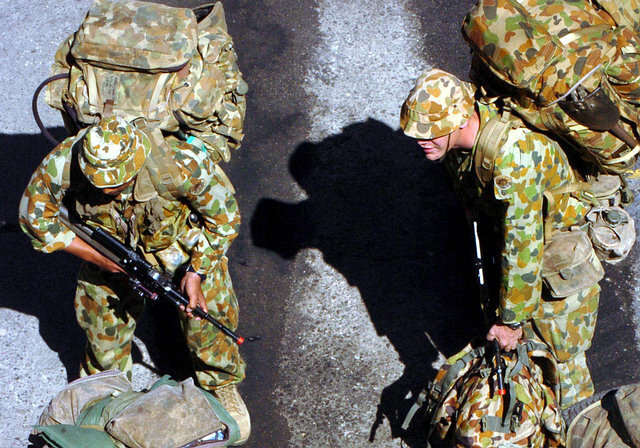 Townsville, Australia (June 11, 2005) Australian army personnel embark USS Boxer (LHD 4) in Townsville, Australia, June 11 in preparation for Talisman Saber 2005, a joint operation involving more than 16,000 service members from Australia and the United States. U.S. Navy photo by Photographer's Mate 2nd Class Daniel A. Jones. Needs one to say more? Small is powerfull! The LM-105 for this Comparison is fired from a 105 mm long (hence the Name) .338" Lapua Magnum Cartridge in a Gain twist barrel with 9 degrees Twist angle (not Inch length!). 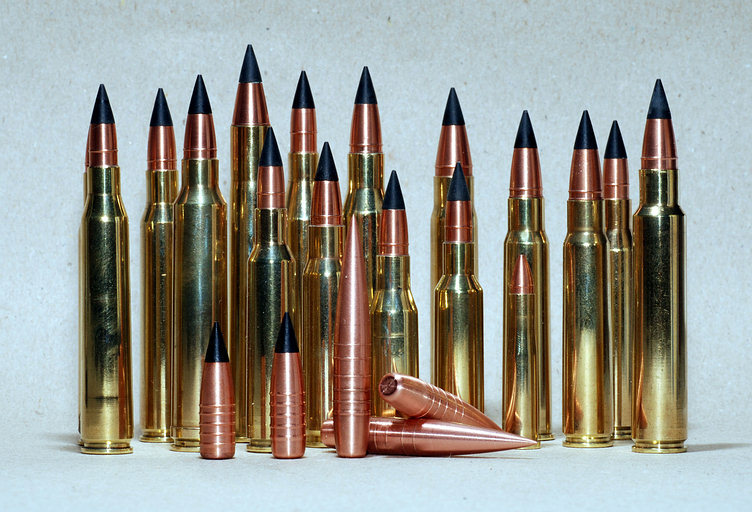 The historical approach to use bigger Cartridges to longer Ranges might be understandable from the Circumstances and especially from a Logistics standpoint, but is a ballistic Error. 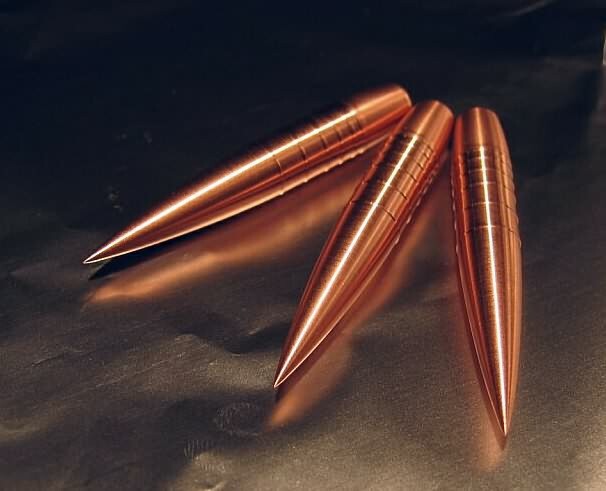 The regular .50" BMG M33 Ball Ammunition, that most Armies list in their Supply chain, is rather inadequate for the intended Purpose, namely to precisely defeat single Targets on long Ranges. 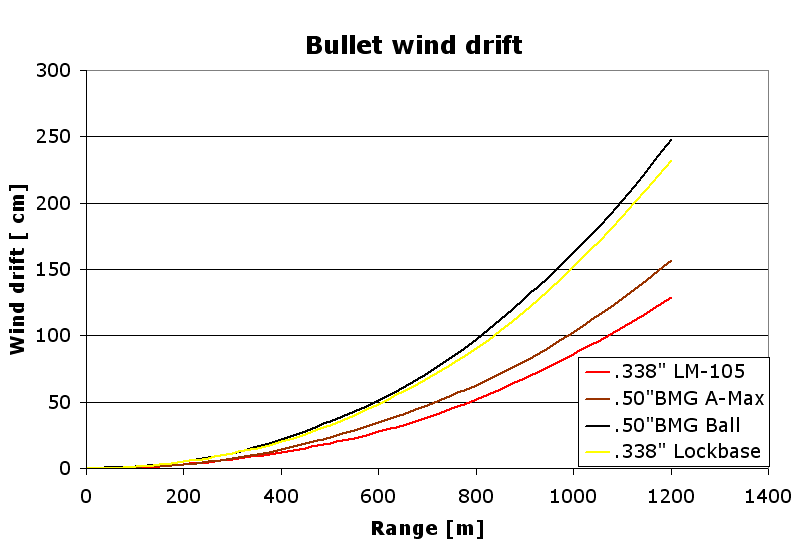 Most the terrible Wind drift (the worst of the four compared Bullets) plus the inadequate Accuracy oft the standard Machine gun fodder, combined its curved Trajectory declass the Round. Tough to shoot, difficult to train, hardly ever fully handled by the Sniper without Fear, but fearless Shooting results in best Hits! The aggressive Blast limits Training and hence Shooters Capabilities to peacefully rest in inner Comfort to aim and hit well! The Signature (Flash, Noise, Dust or Vegetation movement) easily unveil the Snipers Position to Enemy forces, leaving the Sniper quite vulnerable to Counter measures! Both the Rifle and the Ammunition are large and heavy, restricting Movement and absorbing Energy! The Wind drift is less than stellar, but today Wind drift is the only remaining unknown ballistic Input, the Sniper must apply from his Experience an Judgment. Again, when the Round disturbs long, repeated and enduring Training in relative Comfort, such Experience cannot be built up and henceforth such Judgment must remain lousy Guess work, inadequate in any deadly Environment, where the Enemy just waits for a Movement from the other side. 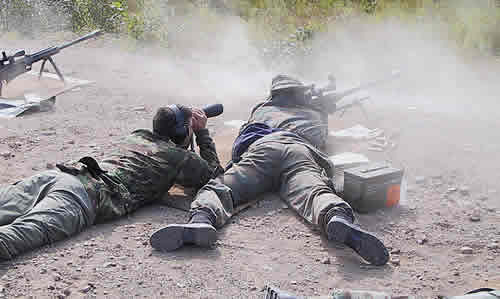 In a Man-to-Man-dependent Conflict (not the Big number game) between Snipers, Intelligence and Knowledge usually wins. Surveillance and Knowledge behind Patience are the key Ingredients to both achieve the Task and to survive. To shoot without a high Probability to defeat the Target just feeds Information to the Other Side. While any Hunter likes to get his Prey he even more likes to return to Home. Imprecise Shooting in a Sniper contest risks that! The .338" Lapua Magnum with standard Lock Base Ball Ammunition has one Advantages over the .50" BMG! 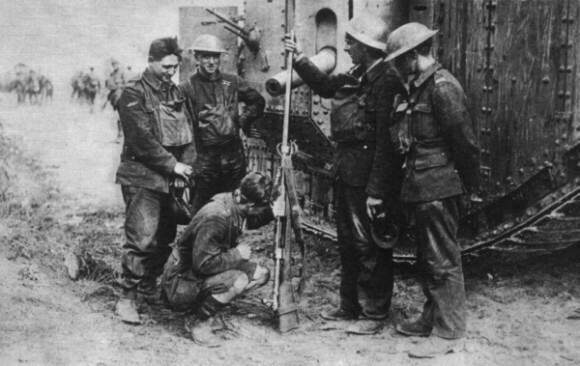 Together with the accompanying much lighter Rifle, the saved Weight grants the carrying Solder a welcome Relief from his heavy Burden, usable to conserve Energy or to extend the Roaming distance off Supply! 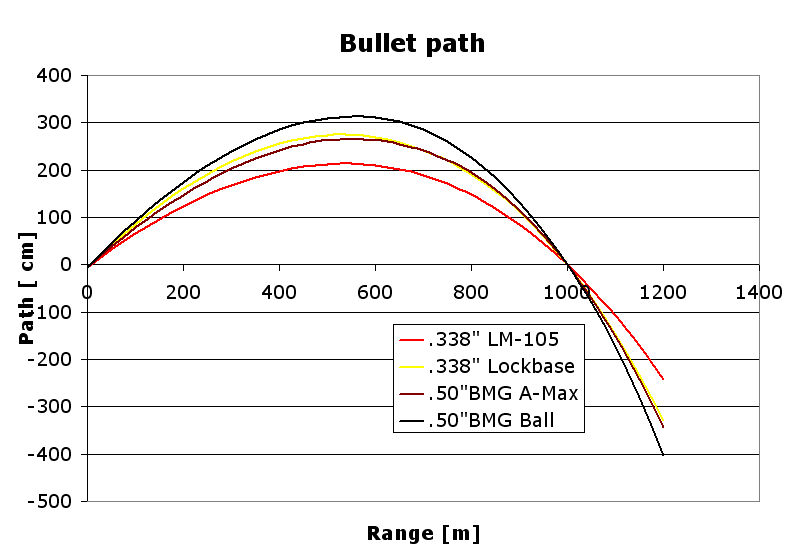 But the .338" Lapua Magnum with standard Lock Base Ball Ammunition suffers one Disadvantages against the .50" BMG! Wind drift unfortunately is worse! With the standard Lock Base Ball Ammunition the .338" Lapua Magnum in other Words does not deliver Performance up to its full Potential. That only does the LM-105. Lutz Möller will demonstrate the LM-105 Bullet on Site in the Country to deliver all together very low Wind drift, Accuracy and flat Trajectory together. The LM-105 won the 2005 Lapua Sniper Cup! 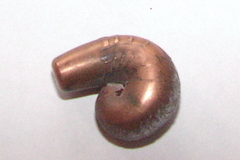 Current repeating Rifles loose their Ability to be Repeaters with the long LM-105 Bullet in the .338" LM Round, designed to be just 93,5 mm short. Current Barrels in .338" LM Rifles will not stabilize the LM-105. New Rifles need to be built to order to first accommodate the wind bucking and hence indispensable long Cartridges and second to suit all other Needs. I will do just that on Order. There is no Stability with the LM-105 in 1:10 Twist. They soon would fly sideways. The Bullet tip is Haack Contour shaped and is 6,5 Calibres long. I needs a 9 Degrees Twist (~ 1 Turn in 176 mm ). Look up Specifications from CIP or SAAMI but reduce Throat Angle to .338" WM Angle. We use a 900 mm Barrel and get 915 m/s Muzzle Velocity at moderate Pressures for the Cartridge. Small an multiple Drive bands introduce a Micro turbulence, that later downstream reduced the Macro turbulence, when the Stream cannot follow. In sum that reduced Drag. The Drive bands must in one Instance be larger enough to take the Land's Shear force, when the accelerated Rotation applies Torque on them, but in the same Instance be small enough not to exhibit too much Resistance in the Throat against Engraving and in the same Instance be as small as possible to reduce Friction down the Barrel. Many Designers fail to optimize their Bullets for a suitable Compromise. Specially those, that have no Drive bands at all. The ">LM-105 is very close. Why only close? Because You need some Margin against Rifle-to-Rifle-Variation and Throat erosion over Time. I haven’t received any reply from you regarding either your plans to come to Australia in May to hunt camels or whether you will be in Dresden in early April (I will be in Germany and will visit you on 06 April 2010, if you are there). I would also like to pick up some of your LM-119 projectiles while there. Please be aware that the Police in my state (South Australia) placed a ban on new .338 Lapua Magnum rifles, as they have moved to ban military long range sniper calibers. So if you intended to bring a rifle in .338 Lapua Magnum, you may have difficulty gaining the import approvals. The same applies to .375 CheyTac. This may not apply in the Northern Territory (the state to the north of South Australia), but I am unsure. Der Anfangsdrall sei 16" und steigere sich bis 8" Enddrall und am Schluß. LM: Für mein LM 105 betrage der Anfangsdrallwinkel 4,5° und der endliche 9°! Mit Zoll habe ich nichts am Hut! Er hat mir aber geraten, mit dem Geschoßhersteller diese Angaben nochmals zu besprechen, da er nicht alle Geschosse und Eigenheiten bis ins Detail kenne. Was ist Ihre Meinung zu diesen Angaben? Compare LM 105 Radar Data to .50" BMG MSG 1273 Radar Data and understand, why aerodynamic Bullets win. Some really love my Bullets. The number their Cars accordingly. Wonderful!